The advice I was given before seeing Battles Without Honor and Humanity was, "Prepare to roll with the punches." 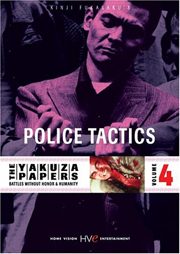 That wasn't enough preparation for Kinji Fukasaku's five-film Yakuza epic, known collectively as The Yakuza Papers. I was already a bit wary of Fukasaku, having been less than thrilled by his later Graveyard of Honor; it was supposed to be a culmination of the director's nihilistic style. I might have appreciated Graveyard more had The Yakuza Papers come along first. It's Fukasaku's idea of a Japanese national epic seen through the tawdry vision of the Yakuza genre. Thirty years of gang warfare for control of the streets of Japan becomes a perverse history of that nation's rise from ignominious defeat to a modern democracy. But the overall impression of the films is that of a violent saga awash in blood, betrayal, treachery and aggression stemming from the open competition for power within the gangs themselves. The clans are organized along business lines and are supposed to function under a code of honor in which underlings make blood oaths to their superiors and remain loyal unto death. 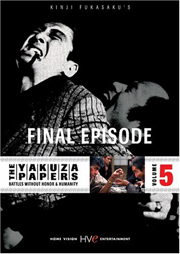 According to the plentiful docu extras included with the boxed set, the previous decade of Yakuza films focused on conflicted but honorable men trying to resolve irreconcilable problems of loyalty. A Yakuza swears allegiance to one boss but retains a blood-brother association with someone in another gang. The resolution is usually a bloodbath followed by a sacrifice, usually a long prison term. The noble Yakuza retains his honor but remains a loser in life. We're told that Fukasaku's The Yakuza Papers changed all that. Based on reportedly true stories of decades of gang feuding, the title "without honor and humanity" is entirely accurate. The previous romantic notion of loyalty is a sham from the start. Vicious gangs build rackets out of the immediate post-war climate of black marketeering and national humiliation. The rituals are all there even though Fukasaku doesn't dwell on them: Thugs attach themselves to clans almost in marriage, supposedly waiving all other ties of loyalty. But most of the soldiers and almost all of the bosses ignore the Yakuza code while working whatever Machiavellian schemes are available to them. Gang personnel are treated as expendable assets. Bosses wheedle and talk about honor while their wives whine on about nobility and make promises nobody intends to keep. If that's not the story of the modern business world, nothing is. The central character is Shozo Hirono (Bunta Shugawara), a handsome ex-soldier who volunteers to pull off a killing for a group of cowardly gang members. He immediately goes to prison and forms a friendship with a Yakuza who uses a faked seppuku attempt as a means of escape. Shozo tries to be honest with the devious and manipulative boss Yamamori (Nobuo Kaneko). He instead finds himself hopelessly mired in split loyalties between rival gangs and frequently denounced by aggressively ambitious rivals. Shozo's moral superiority is only a matter of degree. He is a brutal man as well, but he does balk at the excesses and hypocrisy of his masters. 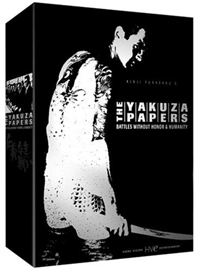 The Yakuza Papers series has a staggeringly complicated plot and one of the boxed set's desired extras is called the Family Tree, a comprehensive story guide that I think even Japanese viewers could use to keep things straight. The film series is often compared to the Coppola Godfather films, but they're really more like a Japanese version of Roger Corman's excellent The St. Valentine's Day Massacre. Every episode starts with a general statement instead of a capsule plot round-up, and the action frequently halts for freeze-framed introductions of new characters accompanied by clinical text. If you thought it was difficult to keep straight the names, ranks and clan affiliations in Samurai films, it's next to impossible here - five or six quick new faces flash by and then the viewer has to fend for themselves. I recommend keeping the Family Tree booklet handy and referring to it often if following the story is of primary importance. Because of parole rules Shozo has to remain in Hiroshima even though the gangs are spread between Tokyo and Kobe and across other parts of southern and western Japan. As in the Corman film a narrator breaks in frequently to leap the story from one violent moment to the next. Long dramatic passages will be punctuated by a series of murders and assassinations presented in clinical fashion. Mostly committed by panicky henchmen, they're sloppy messes of stabbings and shootings with many fumbled attempts. There's an almost comic sequence in the first episode where Shozo decides to atone for a slight the formal way, by severing a finger; a female moll shows him how to do it while the other Yakuza look on in amazement. It's similar to Howard Hawks' The Big Sky when the mountain men get Kirk Douglas boozed up to amputate his infected finger. Later on the ritual becomes grotesque when one of Shozo's men hacks off an entire hand to show his sincerity for stealing scrap metal. As he's crippled himself he's no longer a useful gang member, and all he has proven is that he's too unstable to be trusted. In the early episodes Shozo forms strong ties with doomed Yakuza buddies who try to live up to the code. These relationships give us something to care about in what would otherwise be a completely nihilistic series of rotten deals and betrayals. By the third episode Fukasaku and his writers are veering into political territory, already implied through the constant visual return to that civic building retained as a memorial to the Atomic Bombing of Hiroshima. 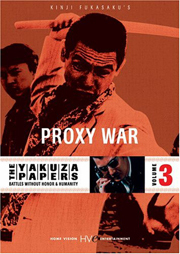 The third chapter is called Proxy Wars in an attempt to show that the Yakuza strife is a microcosm for the Cold War struggle happening in the late 60s - instead of battling in the open, the Yakuza clans allow captains and sub-chiefs to settle conflicts at a lower level in much the way that America and the Soviet Union (in some interpretations) nutured client states to be come substitute combatants. Proxies do the fighting and suffer the consequences, and the masters are free to disassociate themselves when necessary. That's where Shozo comes unto his own. Distinguishing himself by refusing to blindly follow orders, Shozo sees that he's being set up as an expendable proxy and instead pulls his own careful counter move that he hopes will result in the expulsion of his dishonorable boss. Naturally nothing is that easy but it's fascinating to see how Shozo, a good player but no genius, works his way through impossible situations. Fukaksu's style veers between careful compositions and mock-random handheld shots that in some fight scenes really do impart a feeling of absolute chaos. He avoids traditional pictorial graces - no scene can be described as attractive - concentrating instead on lending a sense of you-are-there realism to the drama. It's not uncommon for eight or ten people to be jammed into the same frame. The females in the film tend to be shadowy figures lighting cigarettes on the sidelines. We're limited to a few tragic figures and a shrewish, despicable bosses' wife or two. Sugawara is a terrific personality for the star role and there are literally dozens of players that distinguish themselves in strong character parts. American audiences unfamiliar with most Japanese actors will recognize Sonny Chiba from Kill Bill Vol. 1 and Tetsuro Tamba (Tanba) from You Only Live Twice. 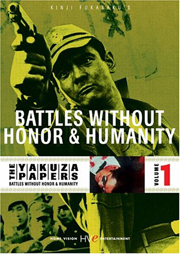 Home Vision's impressively-mounted boxed set of The Yakuza Papers: Battles Without Honor And Humanity comes in a metal sleeve (so I am assured) with a card and plastic insert that folds out like an accordion. An insert booklet has essays by Patrick Macias and Tom Mes and reproductions of original posters. A sixth disc contains a number of interview docus, detailed below. William Friedkin talks about the influence these pictures had on American action films, but I'm not sure they were ever really screened here until the 1990s, in bad-boy action retrospectives at film festivals and the American Cinematheque. In any case the series seems more influenced by the free-form aesthetic of American action movies, especially blaxploitation movies. The cool soundtrack score frequently resembles the catchy jazz riffs from American actioners of the time. Other interview docus concentrate on the director's approach to violence and the evolution of the Yakuza genre. 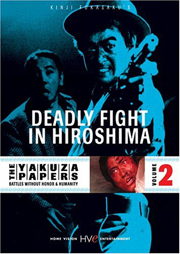 This series is the prime example of "Jitsuroku," movies with narratives claiming to be based on documented fact. Subtitle translator Linda Hoaglund contributes an interesting talk about her work - she claims that the swearing in her subs is all softened from the coarse Japanese originals. The transfers and audio are both excellent and some of the best work I've seen on Japanese films of this vintage. The Yakuza Papers overcomes Savant's prejudice against handheld "impressionist" camerawork by using it with some discretion. My only real complaint goes back to the sound editor's choice of gunshots, which are even more metallic and stylized than Spaghetti western gunshot noises. They're so soft, actors can practically talk over them. The five titles can be bought separately and are entitled: 1. Battles Without Honor or Humanity; 2. Deadly Fight In Hiroshima; 3. Proxy War; 4. Police Tactics; 5. Final Episode. Frankly, I can't see just watching just one or two of these as the interest grows with each episode.